I got this in the post the other day so I thought I'd give it a quick review. 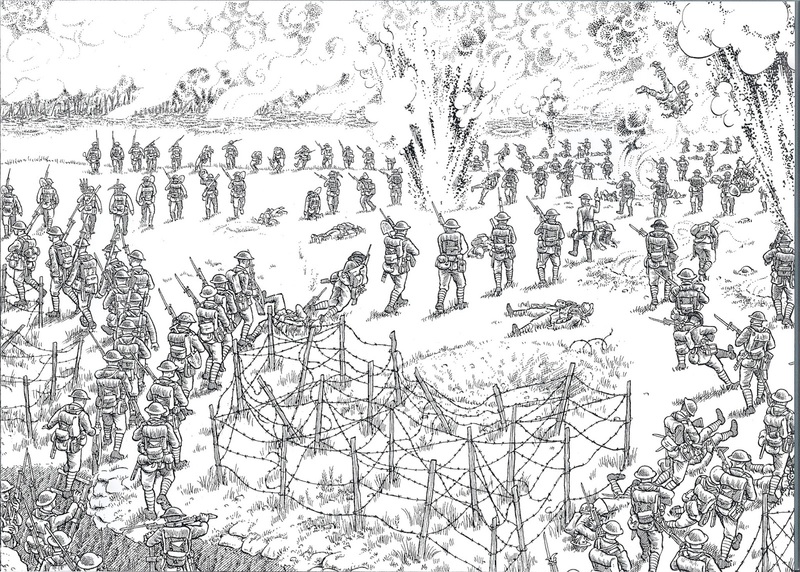 It's the comic artist Joe Sacco's The Great War: July 1, 1916: The First Day of the Somme. Published by Jonathan Cape it retails at £20.00, I got mine from Amazon for a bit less. I'm a big fan of comic art and wanted to see what Sacco had done with the First World War in this work. Out of the parcel one is confronted with a large sized slip case containing the panorama and another smaller book containing an essay on the Battle of the Somme by novelist, journalist and lecturer, Adam Hothschild. I have never heard of Hothschild, despite having just completed a two year MA studying the First World War, but more of this later. Yes, the execution is amazing, as is the artwork, it's a beautiful rendering and full of detail in every panel. Although there is no commentary at all, it is not hard to follow if you have some idea of the opening of the Somme campaign. There is obviously a lot of influence in the images from the film The Battle of the Somme, which was filmed before, during and after the opening of the campaign in 1916. So the presentation, execution and detail are all amazing, however here is what I didn't like about it. I think the title is misleading, calling the book The Great War but only concentrating on one day in a five year war gives the casual reader the impression that every battle was the same and nothing changed throughout the war. Cementing this theme, the essay by Hothschild is typical of the 'Lions led by Donkeys' school of World War One. A historical stance that has long since been overturned by revisionist historians such as Gary Sheffield, John Terraine, John Bourne, Brian Bond, Paddy Griffith, Richard Holmes, Peter Hart, Hew Strachan, William Philpot etc. etc. I would have preferred to have seen an essay by any of the above mentioned who have spent their lives studying the First World War (although a few of them have passed away...) than one by a man who has written one book on the war. Other things irked me, such as the annotations for the panorama by Sacco himself. 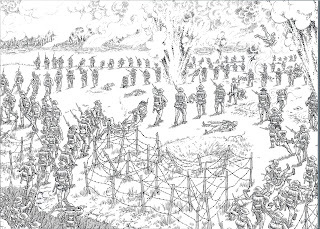 Two of them state: The Soldiers assemble in rows outside their wire. They have been instructed to line up two paces to three paces apart. and The men, many of whom have never been in a battle, are ordered to advance at a walking pace toward the German lines. The Commander of Fourth Army, Rawlinson, allowed local commanders to decide how their divisions would cross No-Man's-Land and the historian Gary Sheffield studied the eighty attacking divisions on the first day of the Somme. He found that only TWO ordered their soldiers to advance at a walking pace, the others found alternative ways of crossing No-Man's-Land. For example, the 36th Ulster Division ran across the ground after forming up in the long grass in No-Man's-Land with the help of saps leading from the trenches. Is Sacco depicting one of the two divisions that walked or is he claiming all the units did the same? This is unexplained in the annotations and to the casual reader it is not clear at all, although I would suspect the latter. Beyond this, the introduction claims that the British army butted its bloody head for a few more months and then stopped, licked its wounds, and set its mind on the next "Big Push". 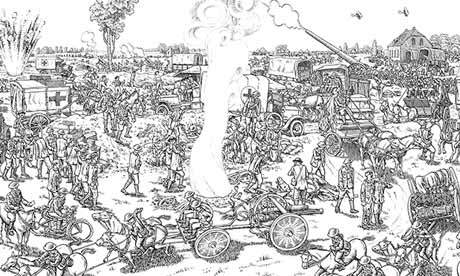 There is no mention of the success in the south of the Somme front on the first day, no mention of the successful attack on July 14, no mention of the reasonably successful use of the tank on 15 September and no mention of the 'learning process' that the British army went through on the Somme. The Somme is also described as a British battle, ignoring the fact that it was a joint French/British venture when initially planned in early 1916, a situation which changed as the Germans attacked at Verdun in February. Having said that, French units were still involved, albeit on a lesser scale than originally planned. A book that concentrates on a single day in the war should give enough background to the campaign (and the outcomes) so the casual reader can understand the situation and consequences. But then what else would you expect from research that appears to go as deep as a few days at the Imperial War Museum's photo archives in London? Some books are mentioned as particularly helpful in the research in the introduction and the only one that is good solid modern revisionist First World War history is Peter Hart's The Somme. I would suggest that Sacco also should have a look through Philpott's Bloody Victory and Gary Sheffield's The Somme. OK, with all that negativity, let's end on some positives, it's a bold project and a very interesting take on the First World War. 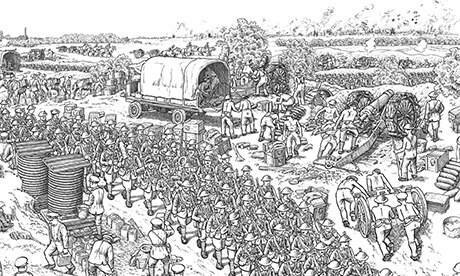 Comics have not really been used to visualise World War One outside of France, so it deserves praise for that. Plus the format is interesting, I like the panorama idea and it fits the subject very well, giving a sense of scale to the build up of the battle. So in sum: As art it is beautiful, as history it is flawed. "As art it is beautiful, as history it is flawed".....nicely said! Thanks Fran, it's a lovely book, I just wish the research was up to scratch!